Who knows whether this soldier's death was suicide or not? If it was suicide, it is at least a piercing moral message to all of us. The most telling sign of the decay of the human race is its toleration of torture. Draw your own conclusions on the article below. to be well adjusted to a sick society." Read comments on her death here. (April 23, 2009) -- With each new revelation on U.S. torture in Iraq, Afghanistan and Gitmo (and who, knows, probably elsewhere), I am reminded of the chilling story of Alyssa Peterson, who I have written about numerous times in the past three years but now with especially sad relevance. Appalled when ordered to take part in interrogations that, no doubt, involved what we would call torture, she refused, then killed herself a few days later, in September 2003. Of course, we now know from the torture memos and the U.S. Senate committee probe and various new press reports, that the "Gitmo-izing" of Iraq was happening just at the time Alyssa got swept up in it. 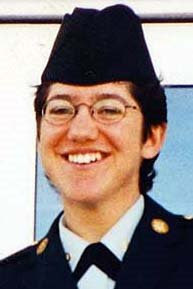 Alyssa Peterson was one of the first female soldiers killed in Iraq. A cover-up, naturally, followed. Peterson, 27, a Flagstaff, Ariz., native, served with C Company, 311th Military Intelligence BN, 101st Airborne. Peterson was an Arabic-speaking interrogator assigned to the prison at our air base in troubled Tal Afar in northwestern Iraq. According to official records, she died on Sept. 15, 2003, from a "non-hostile weapons discharge." According to the official report on her death released the following year, she had earlier been "reprimanded" for showing "empathy" for the prisoners. One of the most moving parts of that report is: "She said that she did not know how to be two people; she ... could not be one person in the cage and another outside the wire." Peterson was then assigned to the base gate, where she monitored Iraqi guards, and sent to suicide prevention training. "But on the night of September 15th, 2003, Army investigators concluded she shot and killed herself with her service rifle," the documents disclose. A notebook she had been writing was found next to her body. Its contents were redacted in the official report. The Army talked to some of Peterson's colleagues. Asked to summarize their comments, Elston told me: "The reactions to the suicide were that she was having a difficult time separating her personal feelings from her professional duties. That was the consistent point in the testimonies, that she objected to the interrogation techniques, without describing what those techniques were." Elston said that the documents also refer to a suicide note found on her body, which suggested that she found it ironic that suicide prevention training had taught her how to commit suicide. He filed another FOIA request for a copy of the actual note. Peterson, a devout Mormon, had graduated from Flagstaff High School and earned a psychology degree from Northern Arizona University on a military scholarship. She was trained in interrogation techniques at Fort Huachuca in Arizona, and was sent to the Middle East in 2003. A report in The Arizona Daily Sun of Flagstaff -- three years after Alyssa's death -- revealed that Spc. Peterson's mother, Bobbi Peterson, reached at her home in northern Arizona, said that neither she nor her husband Richard had received any official documents that contained information outlined in Elston's report. In other words: Like the press and the public, even the parents had been kept in the dark. Tomorrow I will write about Kayla Williams, a woman who served with Alyssa, and talked to her about her problems shortly before she killed herself, and also took part in torture interrogations. She observed the punching of detainees and was forced to take part in one particular tactic: prisoners were stripped naked, and when they took off their blindfolds the first thing they saw was Kayla. She opted out, but survived, and is haunted years later. Here's what Williams told Soledad O'Brien of CNN : "I was asked to assist. And what I saw was that individuals who were doing interrogations had slipped over a line and were really doing things that were inappropriate. There were prisoners that were burned with lit cigarettes." All of this only gains relevance in light of the current debate over whether those who were "just following orders" in torture routines should be held accountable today. Greg Mitchell's latest book is "Why Obama Won." His previous book on Iraq and the media was "So Wrong for So Long." He is editor of Editor & Publisher. this smells... no matter which way you take it.. Yes indeed it does. I would explore the fishier aspects; but I am sure I would attract the attention of every internet surveillance authority in the US and Europe.